Our range of products is manufactured under the administration of qualified quality control executives by using optimum supplies and ultramodern technologies. Our raw materials are essential bottleneck assets and thus these are carefully selected by our expert quality auditors after checking against varied quality parameters. The product is equipped with some user friendly features like compact style, temperature control and convenient operational modes. The company manufactures them to fulfill the needs of the customers who are associated with the laboratory testing applications. We provide Dry Bath at a competitive market price. They are excellent to uses in the research laboratories. 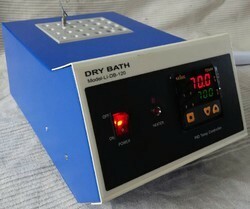 Dry bath is widely used Biotechnology Instrumentation.